Just 11 more days, politicos, 'til this mapquake subsides. 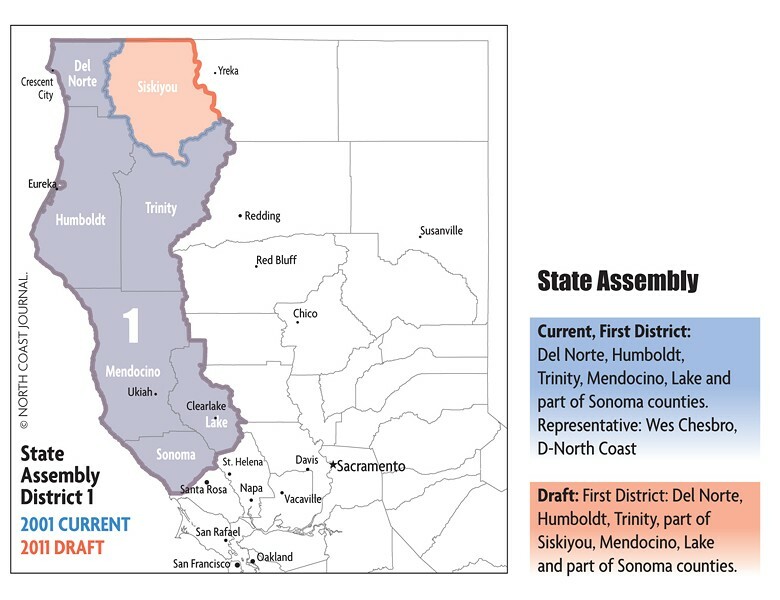 By July 31, the California Citizens Redistricting Commission expects to have finished remapping the boundaries of the state's congressional, senate, assembly and board of equalization districts. The redistricting, which happens every 10 years, will adjust districts so they're relatively equal in population, using data from the 2010 U.S. Census. 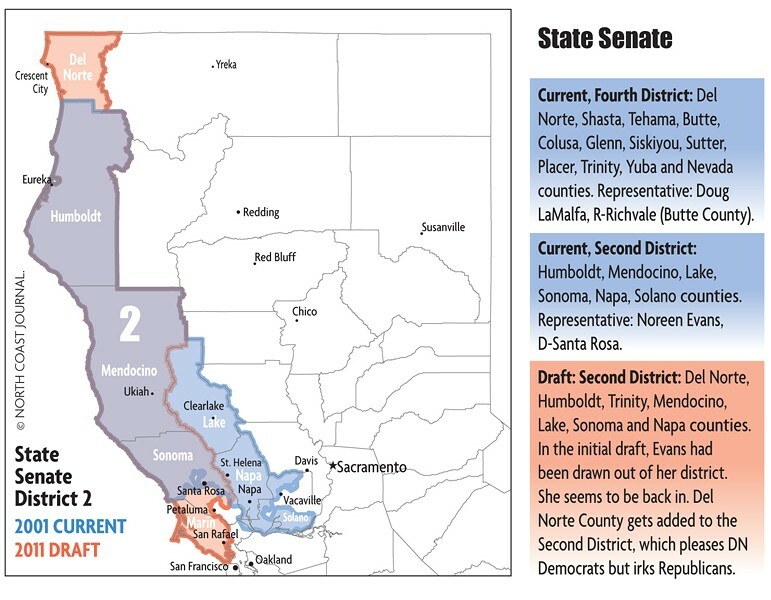 This time around's redistricting, at least here on the North Coast, could end up leaving a bittersweet flavor in some folks' mouths (elsewhere, in crowded SoCal for instance, there could be confusion and mutiny). It will be the first time the procedure's taken place outside of the incumbent-favoring, party-preserving dens of the legislators who've for years been able to create contorted districts that worm and skip across the map. Instead, an independent, nonpartisan commission, with the aid of extensive public participation, is redrawing the map based on non-political (as best can be managed) criteria. The commission, formed in late 2010 in compliance with the 2008 Voters First Act that enabled its creation, has 14 members: five Democrats, five Republicans and four "decline-to-state" members. The districts the commission redraws must, besides being equal in population, be geographically contiguous within their boundaries; compactly shaped (no more of those funny shapes); protective of minorities' equal opportunity rights to elect representatives; and respectful of city, county, neighborhood and "community of interest" boundaries. Sounds good. 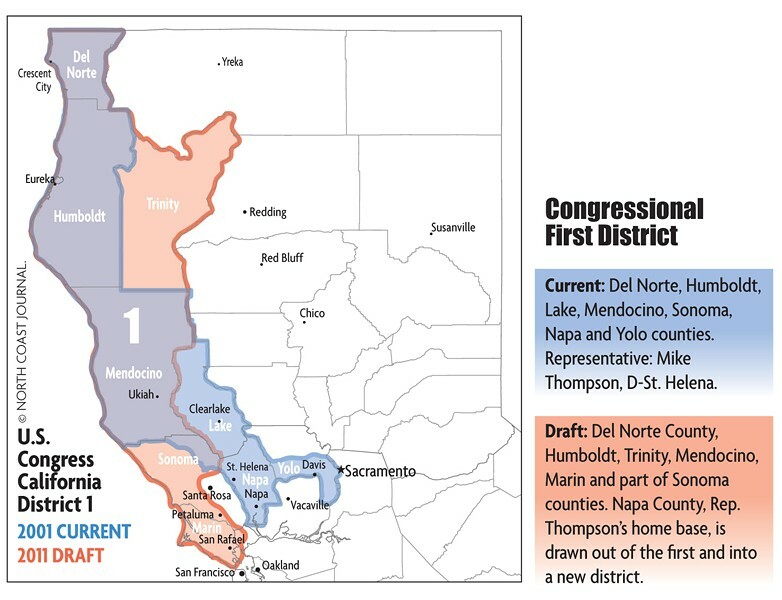 However, the first drafts that the commission put out showed that the North Coast could lose one of its staunchest allies: Rep. Mike Thompson, D-St. Helena, who has been the First District's representative since 1999 and whose home might be re-drawn out of the district. State Sen. Noreen Evans also looked to be redrawn into a new district, but subsequent tweaking of the maps seems to show her back in. That's not all. Humboldt County and its fellow gaunt-faced far-north counties could see urban, densely populated Marin County -- she of the highest per-capita median income in the state -- tacked onto their district. Hardly makes for a solid community of interest, the Humboldt County Board of Supervisors complained in a letter to the commission a couple of weeks ago. But that particular criterion is tough to pin down. Early in the redistricting process, rumor was the First District was going to be flipped sideways to run east-west instead of north-south -- the community of interest there being "north-rural." But, dread -- said some -- that would place the coastal libs in direct confrontation (or conversation) with the landlocked conservatives anchored by quite-populous Redding. Thompson would be missed by many here, especially the fishing community. Though he technically lives in the wine region, and indeed has his own vines, Thompson is an avid fisherman and has long been the fisher folks' friend. "It seems like a travesty to lose him," said Aaron Newman, president of the Humboldt Fishermen's Marketing Association, by phone last Thursday. "He's helped out a lot, making sure there's water in the streams. He helped us get disaster relief when the commercial fishery was closed for nearly three years. Whenever there's a problem -- with navigational markers, with dredging, with whatever -- he's been there for us." Dave Bitts, president of the Pacific Coast Federation of Fishermen's Associations, agrees that it could hurt to lose Thompson. And yet Bitts takes a broader view. "Regardless of how they cut the district, they're probably going to end up with something way better than before," Bitts said. "Overall, the state would probably be better off. If you look at the current district maps, especially of Southern California, you find some awfully ‘different' shapes. ... It's not hard to look at what's happening in Sacramento and in Washington, D.C., and see that it's been [about] safety of the seats all along."